Whether you are a concerned parent or a medical practitioner, buying an otoscope can be a good idea. This small device helps to spot ear infections and other problems so that you can get appropriate treatment. There are numerous otoscopes available in the market, and it is difficult to decide which one is the best for you. While the basic functionality of such octoscopes is the same, they differ in features, performance, durability, and price. So, whether you want an otoscope for a specialized use or profession or want to buy a generic one, this post will tell you about the best octoscopes. 1 What is an Otoscope and What Does it Do? 8 Buying Guide – How to Pick the Best Otoscope? What is an Otoscope and What Does it Do? An otoscope, also known as auriscope is a specially designed medical device to diagnose ear for infections, inflammation, and other possible issues. Healthcare experts diagnose ear during regular checkups or during respiratory ailments, which can result in blockage of the ear path. The doctor pulls the outer ear to straighten ear canal and then closely monitor the inside with the otoscope at the eardrum and canal walls, also known as tympanic membrane. Since the eardrum sits right between the middle ear and ear canal, changes to its appearance can indicate a big problem. While such devices are usually used by doctors only, caring parents can also use it at home, provided they know how to properly use it. So, if you are searching for the best otoscope, then this post will tell you about the same. Here we list best otoscopes in general as well as best otoscopes for home use, medical students, medical professionals, physicians, and best digital otoscopes. Also, we will share a comprehensive buying guide to help you pick the best otoscope for your unique preferences. But before we move ahead, first let us know about the structure of an otoscope. It is important to know about every element of the otoscope so that you can use it properly, without causing harm to your kid’s ear. Most of the popular otoscopes consists of a head and a handle. The head is empowered with a source of light that enables the doctor to have a clear view of the ear from inside. The otoscope also incorporates a magnifying lens, which is usually around 8 diopters that gives you the opportunity to have a clearer view of the ear. Furthermore, the front of the otoscope has an attachment for disposable plastic ear specula. The main purpose of this design is to enable the examiner to easily straighten the ear canal and view the ear from inside. It is vital to handle the otoscope and insert it carefully in the ear because they can be a source of an injury to the ear. For this reason, the examiners are strictly suggested to brace the handle of the otoscope against the head of the patient to avoid damage to the ear canal. Once the otoscope is set on the patient’s ear, the examiner can now look further through a lens on the rear of the instrument. Though you can use a simple otoscope to view the ear canal of the patient, there are other advanced models available, which come with a removable lens. This facility enables the examiner to insert any other instrument with an otoscope to treat the patient. As a result, the patient can receive better treatment. Otoscopes are used by general physicians, at home, and specialized medical professionals. So, let’s check out the best otoscopes under various categories. Parents at home can take a more active role in ensuring their children health with an otoscope. The device can be used to identify potential problems in ears, especially when children feel discomfort due to their ears. Otoscope at home can help to identify ear infections at any early stage, and hence, treatment can be taken accordingly and the problem is cured fast. Otoscopes come in different quality and prices. 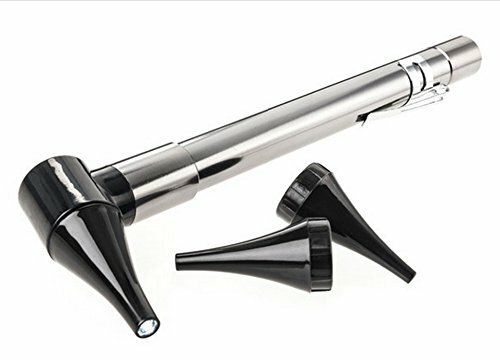 Here, we list the best otoscopes for home use that would sure exceed your expectations. Solid very good quality otoscope with optical glass lens that offers real value. Includes weblink with 30 high resolution photos of eardrum pathology along with use instructions written by an ER physician with many years experience looking into ears. 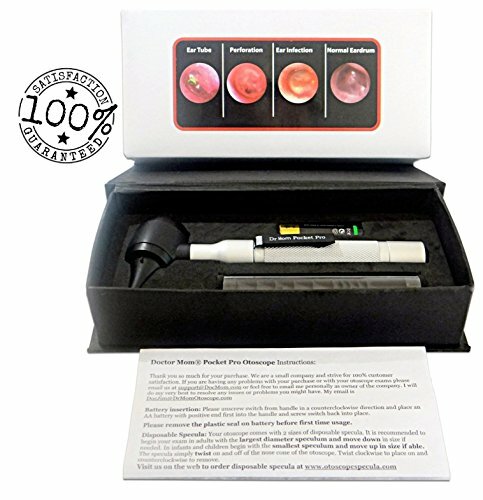 100% Forever Guarantee Covers ANY Issue for as long as you own our otoscope.- This item is built tough and meant to last and that is why we can guarantee it forever from Dr Mom Otoscopes the first home use otoscope company with a 20 year history. We will always make things right if you have any problems, defects, or issues with this otoscope. The Dr. 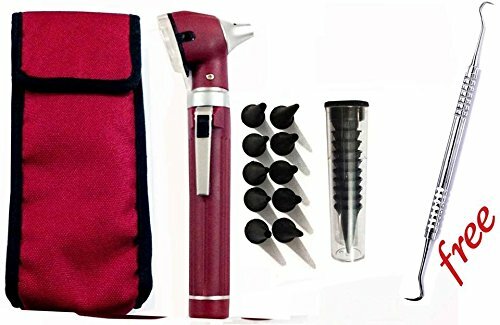 Mom otoscope series has been the most popular ones and this one is definitely one of the best for home use. This device is so easy to use and comes with a full-spectrum LED light that ensures you can use the model for a great deal of time. In addition to being reliable, it is equally elegant and is engineered with optical components made out of glass. Buying it would give you separate specula tips for both children and adults, making it more versatile. The best part is the lens is removable and you can clean it whenever you feel like. Another excellent otoscope for home use is the pocket otoscope from Welch Allyn. It comes with first-class magnifying glass and an extremely high-quality handle, which makes it a highly durable product. Furthermore, it provides sufficient magnification and light that is enough to deliver absolute clarity. Being too compact in size it can perfectly slip into your pocket and can be stored conveniently. The washable speculum tip makes it versatile unit ideal for children and adult use. With 3 times more magnification, this unit is available at an affordable price, and hence, can be a perfect addition to your at-home medical kit. The Notoco otoscope is a convenient and lightweight alternative that is perfect for home use. The unit is equipped with a double-focus light system, and hence, delivers easy utilization and in-depth analysis. Now, this otoscope comes with 3 different tips for infants, adults, and youth respectively. Also, you would get a vinyl carrying pouch, which makes it a portable product. If there is need of replacement, then you can always make an order online. This model is cost-effective and guarantees to deliver long-lasting service. Medical students need an otoscope to examine the ear as well as study the ear and its functions. Being a student, an otoscope is needed to understand the correct way to diagnose ear infections and suggest a treatment accordingly. For this reason, they require otoscopes which are fully functional, slim, lightweight, portable, and durable. So, based on such requirements here we list the top otoscopes for medical students. The first medical otoscope in our list is the most convenient and portable option available. The model comes with two standard AA batteries that ensure you can use the device for long hours. With an on and off switch, the otoscope is easy to utilize. The unit comes with two specula sizes and a soft case, which allows you to carry the product everywhere without worrying about damage. It is a lightweight model available at cost-efficient norms. It is equipped with high-quality optical components, so you can look at crystal clear images of the canal and eardrum. Uses STANDARD disposable specula including the Welch Allyn brand found in most clinics and hospitals. Powered by 2 C cell batteries for a very bright long lasting light. For medical students life is not easy and always unpredictable. There can be potential ear emergencies and the LED Pro model is here to serve you. Considered as one of the best models among users, this otoscope delivers high image clarity and brightness. It features a big lens that comes with superior functionality and quality. The otoscope is made of durable materials, and hence, you can rely on it for a long time. It comes with a complete kit including 2 specula sizes for children and adults. Also, the optical lens is fairly good quality allowing users to clearly see the tympanic membrane. Since it comes from the popular Dr. Mom otoscope series, hence you don’t have to worry about the quality and performance. VISION - Precise and compact magnification lens allows you to SEE inside the ear. 3x magnified detachable lens for easy cleaning with built-in insufflation valve. An otoscope set for all individuals and families! Ideal to view ear wax, objects inside the ear and infections before they get worse. This ear scope gives 30% greater field of view than conventional pneumatic otoscopy. PORTABLE - Hard case with soft foam padding to ensure the SPECv3 is secure and ready for use NOW with 20 x reusable high quality plastic speculum including NEW children sizes. Lightweight and pocket friendly for students and specialists. A great addition to your otoscope ophthalmoscope set. Includes user guide e-book with every purchase! POWER - The SPECv3 is powered by 2x AA Alkaline batteries (Not Included). High power alkaline disposable or rechargeable batteries recommended for MAXIMUM OUTPUT. No wires. Simply insert the batteries and the unit is ready for your examinations. Easy-to-use, practical and super efficient light output coupled with a magnified scope allows for clear and concise checks in medical practice. 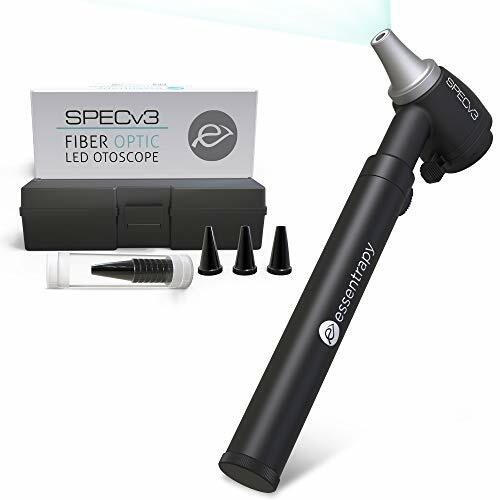 Another notable otoscope for medical use is the SPECv3 fiber optic. This product boasts of its unique white light color with color rendition correction. This implies you can view the actual color of the tissue you are focusing on. Approved by the Federal Drug Administration, it is absolutely safe to use and one of the durable models available. It comes in different sizes of specula tips meant for people of all ages and thereby making it a truly versatile model. Moreover, it is an affordable unit engineered with the highest quality materials and equipped with easy to use mechanisms. So, if you are looking out for a usable device that can help you with your medical studies then this one is surely the best. Otoscopes are important for physicians and medical professionals as they are used to screen for illness and to diagnose ear symptoms. Medical professionals are extremely particular with their tools and do not want to ever compromise on quality, performance, and durability of the product. The items mentioned in our list are the best otoscopes in terms of essential features like quality of the materials, clarity, vision options, and portability characteristics. These items are easy to use and offer the best diagnostics to the patients. Scratch resistant glass lens 5X magnification. Includes DISPOSABLE SPECULA ADAPTOR - Disposable Specula work with our otoscope - reduce risk of spreading infection! Beautiful and durable Chrome plated Brass construction. Uses 2 standard C batteries, re-chargeble's also work well. The first otoscope for physicians and medical professionals on our list is one of the most popular devices from a reliable manufacturer. This unit features a clear image enhanced with professional lenses. It is made of the latest technology, and hence, will never fail to deliver outstanding results. It functions on the basis of fiber optic LED lighting technology, which makes it a professional and reliable accessory for physicians who need to diagnose patients regularly. It allows visualization of true tissue color thereby offering more clarity. Hence, you can check difficult to reach parts of the ear canal. Another wonderful otoscope designed for physicians and medical professionals is Welch Allyn WEL22820, which has been designed with a clear purpose of offering the user accessibility to a reliable product. In addition to viewing the clear image of the ear canal, it allows you to view the tympanic membrane and throat of the patients. You don’t have to worry about carrying a heavy product as this one is lightweight. Further, it features a sealed utility system for pneumatic otoscope functions and also offer a proper wide-angle lens that enables instrumentation under magnification. In all, it is a small, simple, and convenient unit with bright halogen lights and a built-in throat illuminator. 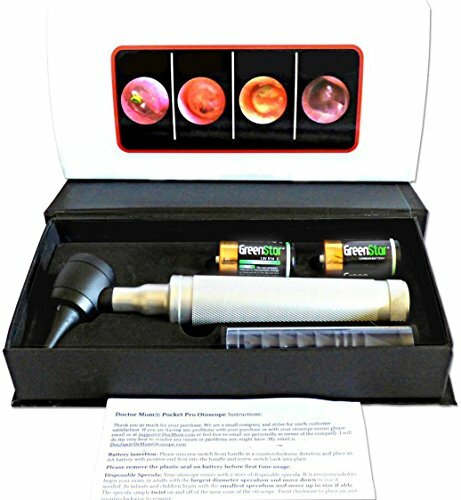 Another excellent otoscope that would perfectly fit into your clinic is the otoscope from DR. Mom. The octoscope is made of scratch resistant body and is designed to offer excellent functionality and absolute protection. It comes with different disposable specula ideal for adult and pediatric use. Quality is an important factor when it comes to select the best otoscopes that you can use. However, the price of the product is also a vital feature to consider. If you cannot afford to spend fortune on an otoscope but still wish to purchase one that is reliable and functions well, then here we list the best and most reliable options under your budget to help you sort things easily. Here we list the best cheap otoscopes that include all important features for use. Includes 3 sizes of specula 4mm for adults, 3mm for children, and 2.5mm for infants. Additional specula are available in packs of 60 from Amazon and our website. If something ever goes wrong with your otoscope even 10 years from now there is usually an easy inexpensive fix. We have engineered and built the otoscope in a way that it is easy an inexpensive to replace any part on it even years after it's initial purchase. We will always stand behind our products! 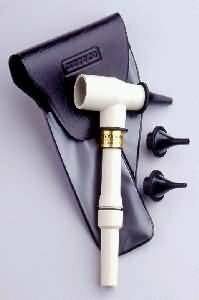 Solid very good quality otoscope that offers real value. Available at an affordable price, this otoscope is a reliable product that does not involve an extra cost for maintenance. It offers not just extraordinary performance but also greatly functional features and an attractive design. It comes with specula of different sizes that allow you to diagnose patients of different ages. Moreover, you can even diagnose the earliest signs of ear infections in the crystal-clear form. With professional lenses that are easy to use and clean, it is a practical product ideal for all medical professionals. 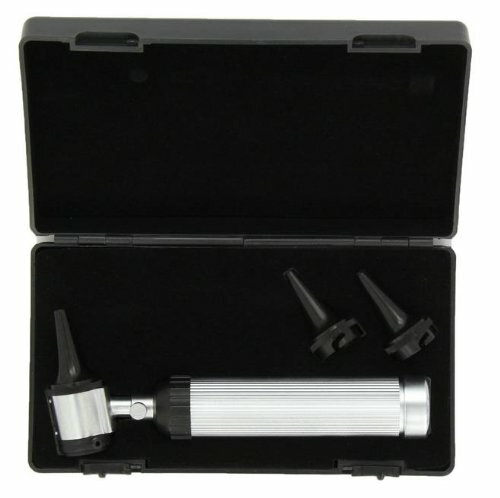 3.2 Volt Professional Diagnostic Otoscope with Bright WHITE LED and upgraded HARD CASE! This stethoscope was mainly introduced with an aim to ensure ease of use of a device while delivering outstanding results for common uses. It is not the best option, though it comes with all needed functionalities and features at a great price. It is perfect to diagnose regular ear infections in patients of all ages. It gives access to LED light technology and comes with lenses that are easy to clean and well-maintained for proper use. Also, it is a moderate weight unit that comes with a soft case, and hence, is easy to carry. It is true value for money and perfect to meet reliable emergency diagnostic with ease. 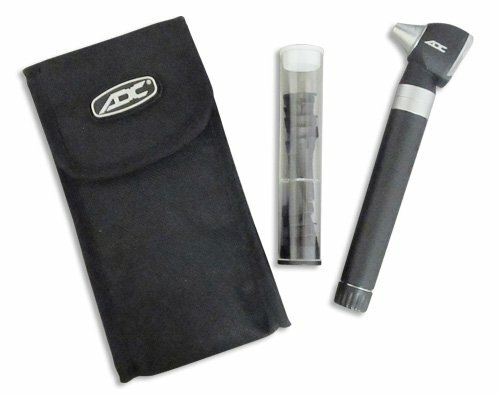 With an easy to use functionality, this otoscope can help amateur and parents to diagnose easily the ear infections. It is suitable for adults and children and is perfect for a professional environment that does not need advanced features. Despite being cheap, this octoscope delivers outstanding performance based on fiber optic technology. The resistant glass lenses and bright light capability make it easy to manage the job. It is easy to clean and does not need any complex instructions to follow. It comes with an instruction manual that explains all the functionalities and displays clear images that help you establish reliable initial diagnostics.  Adoption of new technologies black probe,avoid dazzling image.With the new uploaded light sensitive camera module and 6 adjustable LED lights,will be much more easier to view your ear canal. It is one of the best digital otoscopes that come with a scratch resistant magnification lens. This implies that you don’t have to fork out and replace the lens frequently, which can be the case with other otoscopes. Also, it is one of the largest otoscope models that would not fit into your pocket. Hence, it is a perfect model for medical professionals and students that want the capabilities of a full-size model along with easy portability. The speculums are not disposable but they are of extremely high-quality and can be used to diagnose patients of all ages. It is a bright light model, but may not be able to deliver the performance that you can receive from other models. If you are looking for a digital otoscope at an affordable price, then this one is definitely an ideal choice. [ Why 1080P is more expensive? ] Three Revolutionary software update! 1) the Camera Focal distance is 3.14in~19.7in( 8~50 cm), this is better than before endoscope, which is 4~6 cm. And you see clearer in a long distance. 2) App update zoom in and out, rotate view function. It's very convenient for you to inspect some areas such as cable in pipes, machine parts, circuit board more clearly and accurately. 3) 1080P (1980*1080P,16:9) solution. [ Special Bonus ] Provided a function Stick to you as special gift. Like Selfie Stick, function stick let you check any corner more Handy. [ IPEX Antenna Wireless ] Build in IPEX Antenna with Strong Signal. 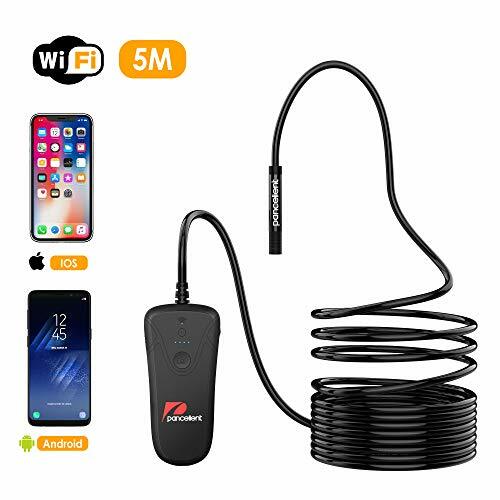 Support Android Smartphone(Above Android 4.2) iPhone IOS devices(Above IOS 8.0) Also Flexible Cable (Semi-rigid Cable) have more benefit, like take more heavy items, check variety place with different shape. We have to mention this super handy otoscope with a digital camera. With a plug and play compatibility without the requirement to install any drivers, this digital otoscope can work efficiently well with Windows XP, Mac OS, Vista 7, 8, 10. The otoscope enables you to save pictures and videos of ears, throat, and nose. Also, you can share such videos and photos with the healthcare experts for further assistance. It is one of the finest models to diagnose health problems before they turn severe. Additionally, you can use the pictures to compare. It comes with 5.5mm digital camera that is small enough to fit conveniently inside the ear canal of children and adults. Most importantly, the 6 LED lights lining the camera tip offers plenty of light to view inflammation and obstructions in the ear. It is easy to clean and is one of the affordable choices available for use. 【The Newest Dual-display APP Function】----Based on the latest dual- image display app technology, this otoscope app can sync show 2 different images at the same time, give your a more clear and intuitive image comparision between past and real-time. Thus you are easy to know your ear/nose health condition and get effective treatment timely. 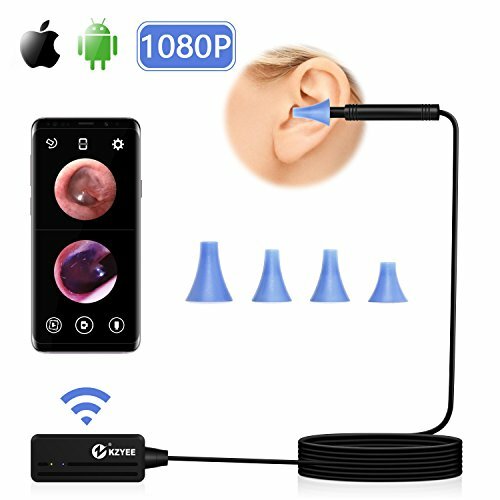 【1080P HD Visual Ear Camera】----With this 1080P 2.0 megapixels wireless otoscope,you can enjoy a wonderful experience to capture HD video smoothly and get a clear and sharp full screen image. NOTICE: Its best observation focus distance to the object is 0.59-1.18inch(1.5-3cm). 【6pcs Adjustable LED Lights】----Equipped with 6pcs LEDs on the camera tip, you can gain more clearly images or videos by the adjustable button to improve brightness in dark or low light condition such in tympanic membrane checking. 【Protective Specula Sleeves】----Our otoscope comes with four specular tips in different size, which are heat-resistant even using it for a long time and perfect for whole family. Besides, the biggest adapter can work as a mini microscope for obversation like checking facial object such as skin,hair and ant. 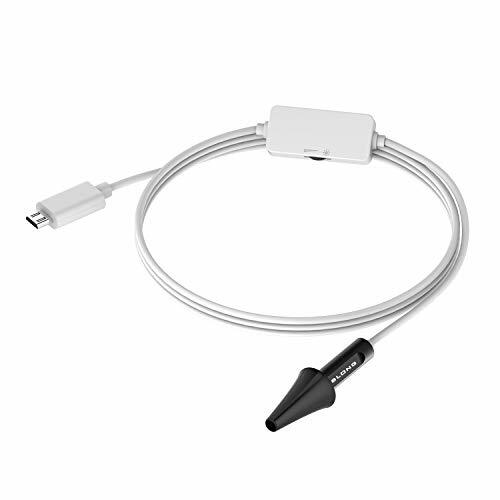 【WiFi Connection】----Built with WiFi transmission, Our digital ear scope supports hotspot connection, not only can work with Android smartphone or tablet(Above Android 2.3), but also iPhone IOS devices(Above IOS 6.0). Just download and install the app"Otoscope" (NOT OtoscopeApp)from google play or App store, then connect to the hotspot "Jetion_***" generated by the Otoscope. Another excellent digital otoscope on our list is one with the newest dual – display APP function. This otoscope is based on the advanced dual – image display app technology that allows the app to sync and show 2 different images at the same time. It gives you a more intuitive and clear image to allow easy comparison between real and past-time. With a camera of 1080P HD, this wireless otoscope captures HD video smoothly and allows getting sharp and clear full-screen image. In addition to this, it incorporates 6 adjustable LED light on the camera tip, which allows gaining more precise and clear videos and images by the adjustable button to enhance brightness in low or dark light condition. The otoscope is built-in with Wi-Fi transmission and comes with 4 specula tips in distinct sizes, which are heat resistant even when using it for a long time and suitable for the entire family. You can always pick the top models from a reputed brand to ensure you get the best quality. But if you are unable to make a choice, then you can purchase otoscope from the most prestigious brands like Welch Allyn, American Diagnostic Corporation, Heine Mini, Depstech Digital, RA Bock Diagnostics, and Bionix. Buying Guide – How to Pick the Best Otoscope? There are different types of otoscopes available on the market, and it is difficult for you to decide which one is perfect for you. The price of such otoscopes also differs, which can confuse you. Hence, we have gathered some basic information regarding the tips you can consider so that you can find the appropriate otoscope for yourself. We have recently added a post on some tips to buy the right otoscope, do check it out. The smallest otoscope is the size of a pen including a clip that allows the user to hold the otoscope in your pocket. Small size otoscopes are much lighter than full-size models. The construction of small size otoscopes is not as robust as it is with larger otoscopes. So, when you select the size of the otoscope, you must consider the environment where you would be using it. Otoscopes with bigger size are ideal for hospitals while smaller ones are ideal for personal use. Additionally, you must consider the type of patients you would be dealing with. It is because smaller otoscopes are used for children, while larger ones are perfect for adults and elders. The weight of the otoscope is also an important factor to consider when buying this device. Another vital factor to consider is the features of an otoscope. 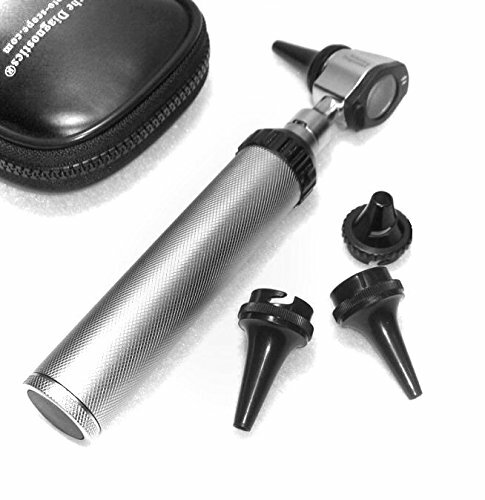 A standard otoscope is incorporated with a magnifying lens and a lamp that allows you to get a look inside the ear. There are some models available with removable lens, which is best-suited for examiners who want to use otoscope with a flexible lens. In addition to this, there are various models available that allow pneumatic otoscopy with an additional port for an insufflation bulb. Also, some otoscope models come with the macro viewer with a standard head that helps to enhance the magnification up to 4 times. Another paramount feature of otoscope is its power. The otoscope can have three different sources of power – disposal batteries, rechargeable battery option, and a power source. Otoscopes with disposal batteries are the most commonly used options as they make the otoscope portable. Otoscopes come with A4 size batteries that have to be changed regularly. Otoscopes with other types of batteries offer more flexibility in working. Otoscopes with rechargeable battery option are the highest in demand as it allows the user to use a single set of batteries for an extended time duration. The users can recharge one battery while the other is in use. Otoscopes with a power source are available with a standard control option. Such otoscopes might not be easy to use but otoscopes with permanent wires have a bracket wall-mounting along the transformer for power supply. It is essential that you got the perfect light source for your otoscope. Otoscopes can have varying light sources, like halogen, LED bulb, xenon, and more. Also, you must select an otoscope with a direct light source and an indirect source of light, or fiber optic. Otoscopes with fiber optics help to direct the light from LED bulb or lamp. This helps the light to directly enter into the car canal and offer better clarity of inside the ear. Another essential factor to consider before buying an otoscope is to decide whether the examiner needs an otoscope with a disposable or a reusable speculum. Most of the otoscope models come with both the options, but it depends mainly on you that what type of otoscope you wish to buy. It is wise to select an otoscope that is versatile and suitable for pediatric and adult use. Do pick an otoscope considering your budget. Medical students and parents can pick a simple otoscope that is cost-efficient, but medical professionals need to pick an otoscope, which is highly efficient, even though if it is expensive. Last but not the least you can always select your preferred color of the otoscope. Sure, the device is going to be used for medical purposes, but you can always select a color that appears good and classy. What is the primary purpose of an otoscope? An ear examination is a part of the routine physical examination by a nurse or doctor. Also, it is done when an ear infection or another kind of ear issue is suspected. An otoscope enables the doctor to look into the ear canal and clearly see the eardrum. What is the difference between Pro Fiber-optic LED otoscope and a traditional otoscope with a halogen bulb? A Pro Fiber-optic LED Otoscope is the first professional otoscope with the LED light source. The biggest benefit of an LED light source over other otoscopes, which uses halogen or incandescent light sources is that LED bulb does not contain a fragile filament. Also, the LED light source lasts forever and will not get damaged by dropping rough handling, or sudden movement. Also, the LED light source is much brighter and incorporates a full spectrum light rather than a yellowish light present in incandescent light sources. What does an ear infection appear through an otoscope? The infection in the ear appears like a fluid in the ear through an otoscope. If the Eustachian tube in the ear gets blocked, fluid develops inside the middle ear. This creates a perfect breeding space for bacteria that can cause further infections. The otoscope can blow a light puff of air to make the eardrum vibrate. Is it possible to see the inner ear through an otoscope? This is possible with a pneumatic otoscope, which is a specialized instrument used by doctors who need to make a diagnosis of the ear infection. If there is fluid in the inner ear, your doctor will witness no or little movement of the eardrum. How to use the otoscope to look into child’s ear? If your child is younger than 12 months, you can pull the ear gently straight back. This would straighten the ear canal and make it simple for you to see inside. Now, hold the otoscope from the handle with your pinky finger outstretched. Rest your pinky finger on your child’s cheek while carefully placing the instrument in the ear canal. While small children tend to be highly vulnerable to ear infections, elders and adults can get them too. An otoscope can help to check the condition before it becomes severe and complicated. No matter what medical profession you are in, an otoscope can be an excellent tool to perform ear checks. So, consider buying an otoscope for your home or clinic as there is a perfect option available for all!